Mention MG in the late 1940s and you’re sure to hear about how the returning servicemen sparked the sports car craze in America with the MG TC. You might not, however, hear about the MG YA and YT sedans that came over with the sporting TC. The first of these Y-Types to be produced were the YA sedans. 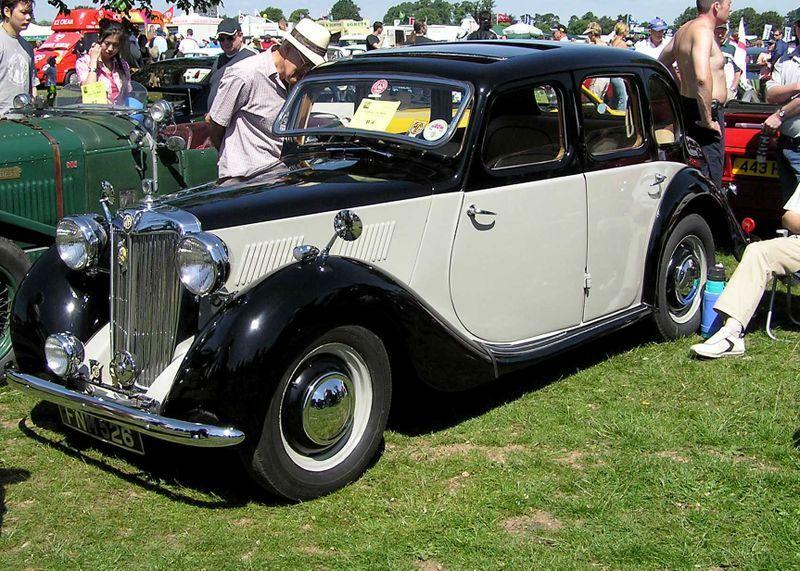 These were four-door saloons with styling that, like many automobiles in the immediate postwar years, hadn’t really been updated since the 1930s. All four doors were hinged at the B-pillar, resulting in suicide doors in the front. The engine was a slightly detuned version of the same 1250 cc inline pushrod four-cylinder unit used in the TC. In the YA this engine was given a single SU carburetor and rated at 45 hp. The transmission was a floor shift four-speed manual with a non-synchronized first gear. Shortly after the YA, the two-door YT convertible touring car was imported. This model used the same engine and tune as the TC, which bumped up compression and used two carburetors to generate 54.4 hp and 64 lb-ft of torque. Predictably, both the YA and YT variants offered more creature comforts than the bare bones T-Series sports cars. Leather and wood appointments fit well with MG’s then-traditional octagonal gauges to the Y-Types a more upscale fit and finish. One notable fact about the YA and YT cars was their use of rack and pinion steering, which was certainly not common in American cars of the day. The Y-Type also used unequal length A-arms and coil springs for independent front suspension. Brakes were drums on all four wheels and featured 16-inch wheels. The chassis was not made of wood, as is often mistakenly asserted, but was a steel ladder frame. The framework on which the bodywork is hung is largely made of oak, as was the case in both the MG TC and TD sports car models. From 1947 through 1950, about 6,131 YA saloons and 904 YT touring cars were produced for American export compared to around 10,000 TC roadsters over the same period. In 1951, the YB sedan succeeded the YA, and only a few changes were made. The engine was upgraded to 48 hp through compression, but still used a single SU carburetor. In addition to the Y-Type’s advantageous suspension design, a front sway bar contributed to the saloon’s sporting credentials. From 1951-53, just 1,301 of the YB sedans were imported to the United States, making them among the rarest MGs in North America. Like all MGs, the Y-Type shares most of its mechanical parts with other models, so parts availability remains strong. Any of the Y-Type models are quite collectible today, and if the car survived middle age without unusual rust or other abuse, any example should be both restorable and worth the work. Adding an additional carburetor with a TC or TD intake manifold should bring the car up to the (admittedly modest) performance levels of the MG sports cars of the day. An MG Y-Type may be among the most expensive MGs to purchase and restore, but in the modern era the car’s rarity is certain to garner special attention.